Signboards are the most important element for the effective communication of corporate identity. An effective signage is the one that is extraordinarily durable, elegant and affordable at the same time matches the decor of the place. A great signage designed by the Sign Board Manufacturers in Chennai is the combination of proper typeface, style, color, good sign system, material & a fine backdrop that complements each other easily. 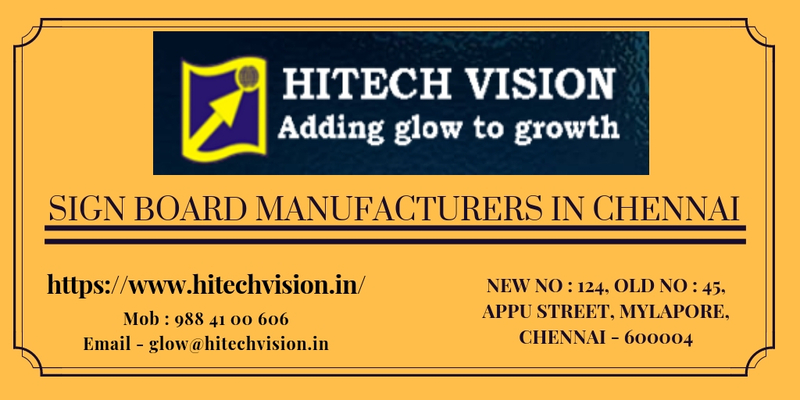 For all your requirements of excellent signboards in Chennai, you can reach HiTech Visions. Sign Boards Chennai is the genuine way of making your label existing in the market, by furnishing the signage in front of the office, metal plates, name boards & indoor display boards will attract the people & make them remember the company name of yours & also make them think about the products you have. HiTech Vision offers the most recent launched DIGITAL DISPLAYS, LED DISPLAYS along with many varieties of eye-catching signages. 3d embossed signs, Halo lit signs, backlit signboards, building elevations. We, giving the best LED Sign Boards in Chennai help you on promoting your business by signboards in the form if Chrome letters, 3d signage letters, Etched nameplates etc. With the help of the best expert team, we create an innovative design which makes your brand to get fame with the help of the signage boards.